There is a wide variety of the slot machines with regard to parametric design and rules. The configuration of a slot machine is specified by the configuration of its display and the configuration of its reels. The display of a slot machine shows the outcomes of the reels in groups of spots (spot refers to a unit part of a reel holding one symbol, visible through its window; a spot on the display corresponds to a stop of the reel; a window can show one or more spots) having a certain shape and arrangement. The configuration of the display can be defined and modeled mathematically through a Cartesian grid of integers, where the gridʼs points stand for the reel spots/stops and a (pay)line is a finite set of minimum 3 points that can be connected through a path linking successively neighboring points of that set. The length of a line is the cardinality of that set. Most of the slot machines have the display arranged as a rectangular grid. Lines can be of any shape and complexity and have all kinds of geometrical and topological properties. There are horizontal, vertical, oblique, or broken lines; symmetric, transversal lines; triangular, trapezoidal, zigzag, stair, or double-stair lines. The distribution and arrangement of the symbols on each reel is also part of the configuration of a slot machine. We denote by p the number of distinct symbols of the machine. If the machine has blank stops, the blank should be considered as a symbol among them. Parameter p is specific to the machine. We denote by n the length of a certain payline. n is specific to that payline. Type B – The reels have different numbers of stops and each symbol has different distributions on the stops of the reels. In case B, denote by the number of stops on reel number j and by the distribution of symbol on reel number j ( and ). Given a specific symbol , the probability of occurring on a reel after a spin is in case A and in case B, where j is the number of that reel. Probabilities , respectively are called basic probabilities in slots. Any winning rule on a payline is expressed through a combination of symbols (for instance, the specific combination ) or a type of combinations of symbols (for instance, any bar-symbol twice or any triple of symbols) and any outcome is a specific combination of stops on that line. Therefore, the combination of stops should be naturally taken as an elementary event of the probability field. We have possible combinations of stops in case A and possible combinations of symbols on a payline of length n across n reels. In case B, we have the same number of possible combinations of symbols and possible combinations of stops for that payline of length n.
Simple events. These are the events related to one line, which are types of combinations of stops expressed through specific numbers of identical symbols (instances). For example, on a payline of length 3 is a simple event, defined as "two seven and one orange symbols". Complex events of type 1. These are unions of simple events related to one line. For instance, the event any triple on a payline of length 3 of a fruit machine is a complex event of type 1, as being the union of the simple events , , , and so on (consider all the symbols of that machine). Any double or two cherries or two oranges or at least one cherry are also complex events of type 1. Complex events of type 2. These are events that are types of combinations of stops expressed through specific numbers of identical symbols, related to several lines. For instance, on paylines 1, 3, or 5 is a complex event of type 2 expressed through "two seven and one plum symbols". The event on at least one payline is also a complex event of type 2. Complex events of type 3. These are unions of events that are types of combinations of stops expressed through specific numbers of identical symbols (like the complex events of type 2), related to several lines. For instance, any triple on paylines 1 or 2 is a complex event of type 3. At least one cherry on at least one payline is also a complex event of type 3.
where F(E) is the number of combinations of stops favorable for the event E to occur. where is the number of instances of , and so on, is the number of instances of ( ). Formula (2) can be directly applied for winning events defined through the distribution of all symbols on the payline, in case A. These are simple events. For more complex events, we must apply the general formula (1), which reverts to counting the number of favorable combinations of stops F(E), or, for particular situations, apply formula (2) several times and add the results. where and are the basic probabilities (the probability of symbol S occurring on reel number j, respectively k). We call two lines independent if they do not contain stops of the same reel. This means that the outcome on one line does not depend on the outcome of the other and vice versa. Two lines that are not independent will be called non-independent. For two non-independent lines, the outcome of one is influenced (partially or totally) by the outcome of the other. This definition can be extended to several lines (m), as follows: We call m lines independent if every pair of lines from them are independent. From probabilistic point of view, any two or more events each related to a line from a group of independent lines are independent, in the sense of the definition of independence of events from probability theory. In the previous figure, lines and are independent, while and , as well as and are non-independent (for the last two pairs, the lines have a stop in common). In the previous figure, lines and , and , and , and therefore , , and , are non-independent, since within each of the mentioned groups we have stops of the same reel on different lines. In such configuration, there is no group of independent lines, regardless the shape or other properties of the lines. An immediate consequence of the definition of independent lines is that if two lines intersect each other (that is, they share common stops), they are non-independent, so any group of lines containing them will be non-independent. Another consequence is that if two lines are independent, they do not intersect each other. If two lines do not intersect each other, they are not necessarily independent. For instance, take lines and in the last figure. On the contrary, lines and not intersecting each other in the last but one figure are independent. 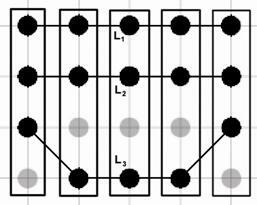 The non-independent lines (intersecting or non-intersecting) for which there are non-shared stops belonging to the same reels (like lines and in the last figure) are called linked lines. For events related to linked lines, the probability estimations are only possible if we know the arrangements of the symbols on the reels, not only their distributions. - each reel contains p symbols; this is actually a convention: if a symbol does not appear on a reel, we could simply take its distribution on that reel as being zero. Of course, any practical application can be fulfilled only if we know in advance the parameters of the given slot machine, that is, the numbers of stops of the reels and the symbol distributions on the reels. All the probability formulas and tables of values are ultimately useless without this information. In the book The Mathematics of Slots: Configurations, Combinations, Probabilities you will find explained some methods of estimating these parameters based on empirical data collected through statistical observation and physical measurements. Of course, taking into account the incomputable error ranges of such approximations, any credible information regarding these parameters should prevail over these methods of estimating them. The Mathematics Department of Infarom will launch soon the project Probability Sheet for any Slot Game, dealing with collecting statistical data from slot players, using the data to estimate the parameters of the slot machine, refining the estimations with the newly collected data and computing the probabilities and other statistical indicators attached to the payout schedule of the slot machine, in order to provide the so-called PAR sheet of any slot game on the market. Contact us with subject "slots data project" if you want to be part of our future project. This section is dedicated to practical results, in which the general formulas are particularized in order to provide results for the most common categories of slot games and winning events. The practical results are presented as both specific formulas, ready for inputting the parameters of the slot game, and computed numerical results, where the specific formulas allow the generation of two-dimensional tables of values. The collection of results hold for winning combinations with no wild symbols (jokers) and is partial. You can find the complete collection of practical results in the book The Mathematics of Slots: Configurations, Combinations, Probabilities, for 3-reel, 5-reel, 9-reel, and 16-reel slot machines. On a 3-reel 2 x 3- or 3 x 3-display slot machine, any two paylines are linked; therefore we cannot estimate the probabilities of the winning events related to several lines. The 16-reel slot machines usually have the 4 x 4 configuration of the display. The standard length of a payline is 4, but it could also have the length 3, 6, 7, or 8. The 16-reel 4 x 4-display slot machine could have 8 to 22 paylines of length 4, as follows: 4 horizontal, 4 vertical, 2 oblique (diagonal), or 12 trapezoidal lines. It could also have 4 transversal stair lines of length 7, 12 double-stair lines of length 6, or 10 double-stair lines of length 8. It could also have 4 oblique lines of length 3. – Any combination of at least one of three specific symbols (on a payline of length at least 3; for example, (any bar any bar any bar any bar), with three bar symbols like , , , for a payline of length 4). The table notes the probabilities of the winning events on a payline of length 4. For the probabilities of these events, we considered only paylines of the regular length 4 in case A. 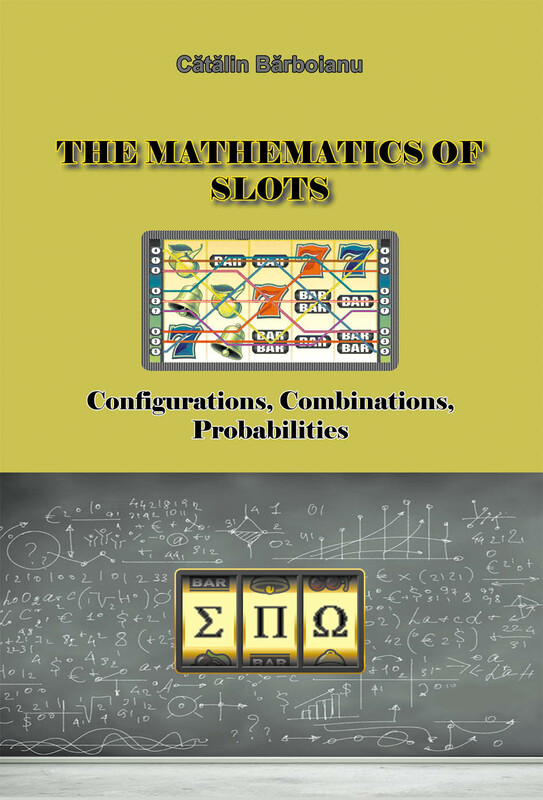 All slots probabilities and other statistical indicators, for the most common types of slot machines and the most common winning events, are covered in the book The Mathematics of Slots: Configurations, Combinations, Probabilities. The collection of probability results is presented along with the mathematics behind the slot games. See the Books section for details.